After nearly a month, Champions League action returns. 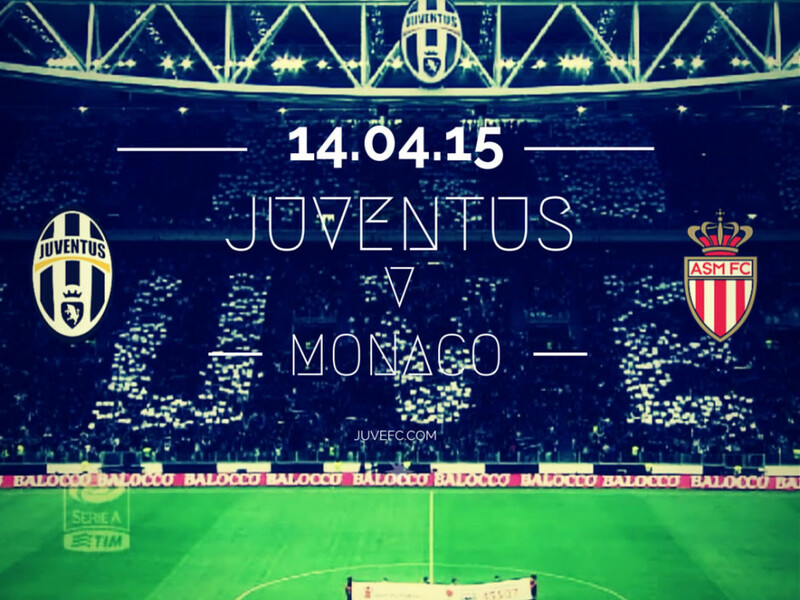 Juventus, fresh off their upset loss versus Parma, host A.S. Monaco for the first leg of their quarter final match up. Juventus have most of the side available, though the usual suspects are injured, and Paul Pogba is still out for a few more weeks. Andrea Pirlo and Andrea Barzagli, however, as well as Carlos Tevez, are all available. Max Allegri is expected to go with a 4-2-3-1. Gianluigi Buffon, who missed the Parma match, will start in goal. Stephan Lichtsteiner and Patrice Evra will start on the flanks, and Leonardo Bonucci and Giorgio Chiellini will start as the centerback pairing. With Pirlo available and Pogba out, Allegri will probably start Pirlo at the regista slot, while Arturo Vidal and Claudio Marchisio start in central midfield. It will be interesting to see how Juve’s attack shapes out with the more experience but less agile Pirlo playing regista, and not Marchisio. In my opinion, Marchisio’s speed in that position is a bit more useful in Champions League, but then the Pogba injury forces Allegri’s hand anyway. Roberto Pereyra should start in the trequartista role. Finally, Allegri’s starting strikers have picked themselves with their Champions League performances: Carlos Tevez and Alvaro Morata. The duo are quite deadly together, both in possession and perhaps even more so in a counter attack. Monaco like to sit back and counter, so it’s not hard to imagine in some Juve “counter-counter” attacks led by these two. I have to admit I was a bit worried when @DTenenbaum approached me and asked me to write a bit on Monaco. Last time I gave my views on Monaco it ended up with Arsenal getting knocked out. But to be fair, it wasn’t entirely my fault, I gave Monaco the credit they deserved and football is a game of luck most of the time. Juventus should—and will—enter the first leg of this tie much more prepared and less arrogant than Arsenal did. Allegri will have had his men prepared for the game and the players to look out for. And while Allegri would have taken a lot out of what Monaco did to Arsenal, there is a lot more to them than what we saw over 180 minutes. What? You thought Monaco was all about defending? You’re sorely mistaken my friend. Monaco have evolved a lot from the group stages. The tight defense is still going strong but they’ve started to score more goals both in league and CL. With that being said, their biggest strength still lies in defense. With everyone fit they are a tough team to break down and are a resolute defensive unit. Before their game against Arsenal, Monaco had only conceded 1 goal in the group stages. 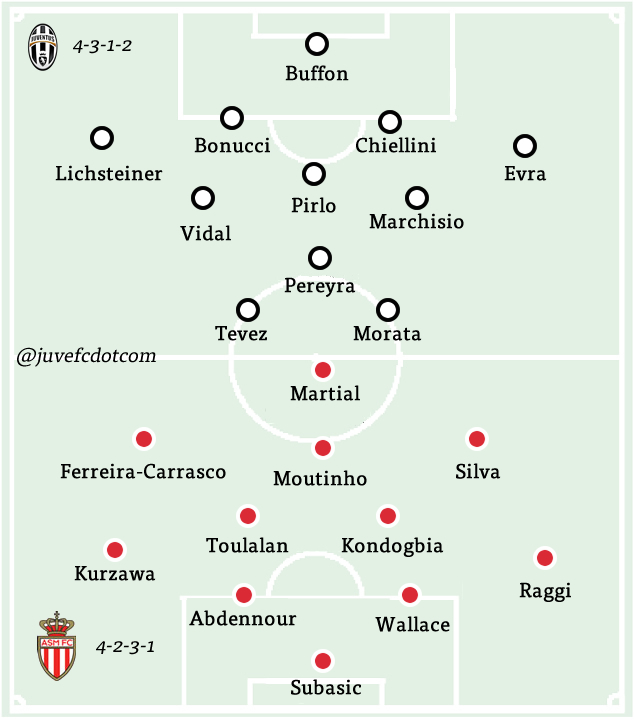 Monaco play 4-2-3-1, but usually revert to a 4-1-4-1 formation in bigger games or when away from home. Defensively, they are very strong, with centre-back Aymen Abdennour the star man at the back. At full-back, Monaco are very strong. Layvin Kurzawa and Fabinho are superb attacking options, both technically and athletically. They are both excellent crossers of the ball and neither will stop running all game. Players like Evra and Lichtsteiner will have their work cut out for them and will have to be wary of the threat Monaco pose down the wings. Both players will have to be on their games defensively. In midfield, Monaco have Joao Moutinho and Geoffrey Kondogbia; our Pirlo and Pogba. Kondogbia is their star player. He’s often been compared to Paul Pogba but they are two different players. Kondogbia actually has a defined role – he breaks up play and works box-to-box – while Pogba still struggles to have a defined role for both club and country. Both are strong, good on the ball and not afraid to stick the boot in when needed. Toulalan being unfit is huge, as it means Monaco will have to play 4-2-3-1 with Moutinho and Kondogbia sitting deeper, instead of 4-1-4-1 with Toulalan as the DM and the other two further up the pitch. Silva will most likely play the number 10 role if Toulalan is benched, he’s a good attacking option but his mind isn’t always on defending. Upfront Monaco have Berbatov, he’s no Carlos Tevez or Álvaro Morata but he’s a player that will keep Juve’s defense on their toes. They’ll also have Anthony Martial out on the wings. He’s raw, quick and gets caught offside far too often, but his ability on the ball is superb. He also does his fair share of defending. He’s often been compared to the former Juventus player, Thierry Henry but he has a long way to go before he reaches his idols stature. This is the thing with Monaco, they are a very frustrating team to break down and Juventus will have to be very patient. They defend like warriors, something Juventus fans are familiar watching their own team defend. Their attacking play relies heavily on individuals performing more than collectively like Juve. They have problems breaking down teams and creating chances but when they do create chances you can bet on the likes of Carrasco, Berbatov and Martial to be there to put them away. Juventus will have to look out for Monaco’s three main attacking players: Carrasco, Martial and Silva. They are in excellent form. Full of pace, energy, skill and trickery, all three combine to create a real handful for any team that struggles with pace. It’ll be very tough for Monaco. Arguably there is more of an expectation on them to get a result in the away leg than the home leg. But there is something special about Monaco this season in Europe. They won’t be afraid to give a real fight but Juventus are the favourites and must show the respect Monaco deserve and beat them. 4-2-3-1: Subasic; Raggi, Abdennour, Wallace/Carvalho, Kurzawa; Kondogbia, Toulalan; Silva, Moutinho, Ferreira-Carrasco; Martial.